Sometimes the voice of the inner bully is deafening. It screams so loud that I can’t hear myself think, let alone receive the creative inspiration I need when I’m writing. On those days I take my inner artist by the hand, walk her to our writing desk, and stand behind her as she gets started. I’m getting pretty good at handling the critics that live in my head. Sometimes I simply let them have their say. I sit on the floor in my office while they drone on and on about how I’m a good writer, but not great, and I do my nails until they get tired. Other times I go to my computer, open my journal, and type everything they say until they notice that I’m merely taking notes, not taking it in, and they quiet down. The best tactic of all is when I call a fellow artist and spill the beans about what’s going on. I tell her what my inner critic is saying so I can hear her tell me that she has the same voices squawking in her head, too. We laugh and cry, coach and console each other, and then we both get back to work. So I gave up the fight. 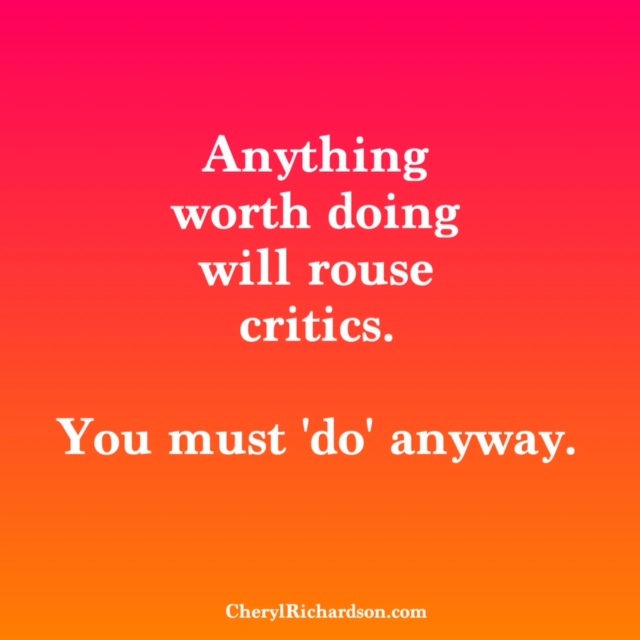 I surrendered to the reality that anything worth doing is going to rouse critics (both inner and outer, by the way), and since I’m only interested in doing worthy things, I’d have to learn how to live with them. Fortunately, she listens. Because in the end, that’s all we really need – a loving friend to host our fear until it feels seen and heard and ready to dissolve. And it will. The power of creativity is too strong to be held hostage. A committee of critics will always be on the attendee list of any significant creative event. Just make sure you invite way more friends. This week’s video is about the healing power of trees. You can watch it, here. Thanks, Nanna!